Portland, Oregon is home to a new outerwear company in Homeschool Snowboarding and they are out to refocus the game. Ultimate breathability folks, pay attention. You sweat, it condenses inside your gear, you get wet from the inside out. When it isn't even raining or snowing or maybe even wet outside at all. You're sweating, so you stay wet. Garbage bags are water-resistant, but we can do better. Enter Cocona xcelerator technology. Activated carbon from coconut fibers. You need to keep the kit in a locked briefcase. I don't understand it, they do. End of the day, hyper-breathable and still water resistant. Now on to the real jacket. The hood actually works OK over my XL dome-piece. First off, the breathability listed at 30,000gm performs as advertised. I wouldn't advise playing a basketball game in Death Valley in it, but for snowboarding and related exercise (hiking to your favorite spot) it shines. On New Year's Day, I hiked out Mt. Baker's Shuksan Arm to Safety Ridge in conditions that would normally have me in just a base layer. The With Teeth jacket (vents fully open, of course) was up to the test more than my hungover head and gut were. The only thing I could compare it to is my Volcom Gore-Tex Soft Shell. It's close, but I give the edge to the Homeschool jacket. I might have to wear the Volcom again to compare. I haven't worn it all year. Do me a favor, though, don't buy a jacket like this and wear cotton underneath. I know, not everyone has access to the full Cocona Continuum Trifecta (that's base, mid and shell layers). God knows, I wish I did. You're going to want to layer up, though. This is a shell, as in no insulation. Just be sure to get some wool or polypro. You can pick this stuff up second-hand at Goodwill or Army surplus joints anywhere. You sweat into cotton, it doesn't much matter what your shell is, you're going to be wearing your sweat far longer than is comfortable. Sorry for the rant, but cotton kills, remember? The water resistance is rated at 10,000mm, not stratospheric by any stretch. The argument is that unless you're drinking from a fire hydrant, you don't need anything more. In fact, more would sacrifice breathability and we'd be back to that Hefty bag scenario. In my days with this jacket, I would agree. It's seen plenty of wet northwest conditions and I've never felt better. Now, water doesn't always bead right off. Sometimes it looks like it's seeping, but like I said, I've never gotten wet. This is a 2.5L jacket. Good enough for Mt. Hood this winter (more rain than snow) should be good enough for anywhere. The company calls their fit the "Homeschool Engineered Fit." It's not tight or flattering, but it's not baggy either. Sorry ladies, no women's-specific cuts. I measure a 29 1/4" sleeve and a 38" chest and went with the large size. 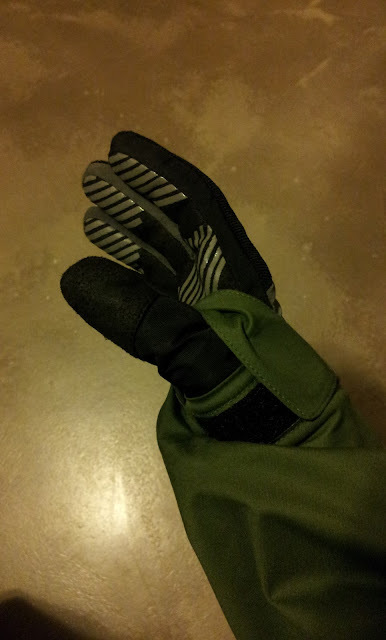 Partly because I like my jackets a little bigger and partly because this one doesn't have wrist gaiters and I have to run the cuff straps over the thumb to keep things dry. This takes some effective length from the sleeve. I would still like a wrist gaiter on every jacket. How about that hood so prominently displayed in the top picture? Homeschool calls it the Darth (wind) Hater. It's adjustable via three elastic tabs ( two side, one rear). The front zipper comes to your lower lip and the panels on the sides come to the bottom of your goggles. Ideally, all you have to worry about are your nose and lips. I rarely use hoods, but this is the best I've seen. A smear of your favorite weather proofing on nose and lip (I use Dermatone) and you're invisible to the elements. Up until now I've been pretty positive, but it's not all powder days and sun rays in this jacket. The front zipper is a big and burly Riri Aquazip, that's great. Why then do you need an inside storm flap and a 3/4-length outside flap for it to get caught on (which it does every time)? I say get rid of the inner flap, which is usually the culprit, and keep the outer which gives you the option to throw the coat on with just a couple snaps and the central, magnetic closure. I'd like a better powder skirt. Homeschool uses the snaps, which are good, but there must be a better fix. Just because I like my jacket a little bigger shouldn't mean my powder skirt works worse, which seems to be the case now. I hate the fact that the zippered skirt is patented, but if you put the loops for the snaps a little lower on the pant, that would be a good start. That's it, kids. That's all for the negatives. Snaggy zipper, good-but-not-great pow skirt and no wrist gaiters. Can you live with that? Are you OK with no flashy color options? If so, you get a long list of benefits. Breathable, water resistant and still supple fabric. The best hood in the game. Well thought-out pockets including a chest media pocket, a clear pass pocket and magnetic closures on the waist pockets. A Recco reflector. Mesh-backed pit zips. Fully-taped seams and mesh lining. All with a clean cut and subtle styling. No neon outside, but the print inside shows some classy flair. Durability is always a question in a quick review like this one. The With Teeth retails at $325. For that price, I want a jacket that will last a few years. Here it is mid-February on an off snow year. I've taken it through the trees a bit and taken some good spills in it and it hasn't shown any wear yet. Whether it holds up for years to come will be revealed in the years to come. For now I can only say that I recommend giving Homeschool Snowboarding and the With Teeth jacket a chance. Check back later for long-range updates in the 'My Gear This Year' series as the years go by. 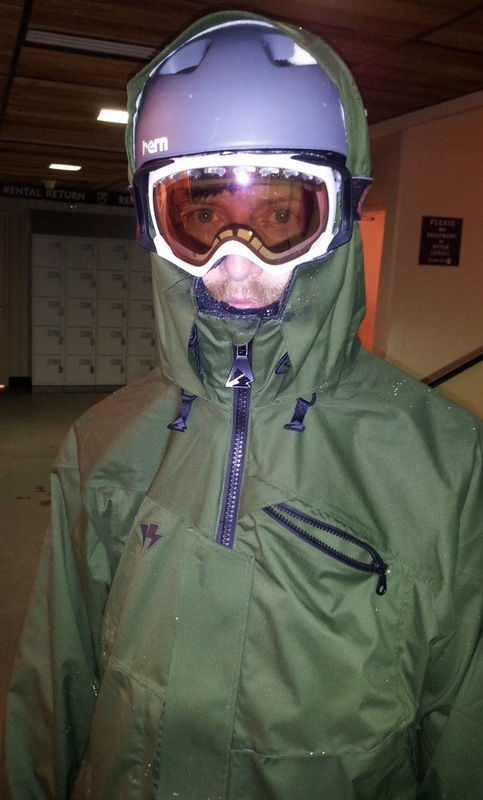 Yes, homeschooling Snowboarding With Teeth 2.5L Shell Jacket Review is awesome to me. I think the Jacket is cool. Love this entry which is full of info's. Thanks for this allocation.